I have a new version of Morse Pad for the iPad/iPhone/iPod Touch. This update includes an improved decoder which better handles improper dot / dash / space timing by the sender (poor fist), automatic speed (WPM) algorithm, and adds AFC (Automatic Frequency Control), which auto tunes in the strongest signal present. This entry was posted in Apps, Ham Radio, New Products, News, Shortwave Radio and tagged Apps, Black Cat Systems, Chris Smolinski, Morse Pad on December 27, 2016 by Thomas. If you have an AFE822 Dual Channel SDR, and a Mac, run, do not walk, to the SdrDx website, and download a copy of the beta version. It now lets you phase the two inputs, much like using an external phaser such as the MFJ-1026. Great for nulling out another station, or noise/QRM. I have some descriptions of how to do this, along with some recordings, and the relevant links, in this HFU post. I believe a Windows version will be out shortly. There’s gain adjustments for each RF input, as well as a phase control, an invert switch to flip the phase 180 degrees, and switches to zero either of the RF inputs, useful when first roughly setting up the gains. I am quite impressed with how well it is working. As an example, here is a recording of 1680 AM from earlier this morning. I toggled the invert on the phase control a few times, so you can hear reception flip between the two dominant stations on that frequency. This is going to be really nice for MW DXing. 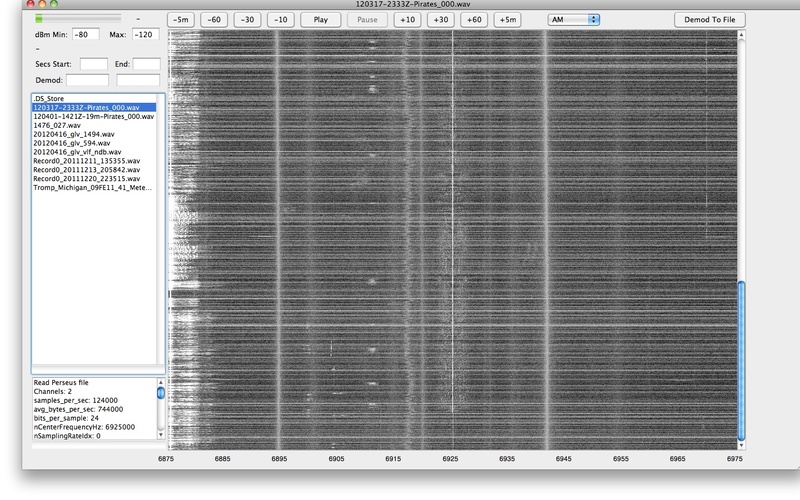 SdrDx is for both Windows and the Mac. If you’ve been considering getting an SDR, this feature alone in SdrDx is reason enough to get an AFEDRI AFE822. If you do buy one, be sure to let Alex of AFEDRI know the reason is because of SdrDx, we need to support the authors of third party SDR apps we use, and let the hardware manufacturers know how important they are. Some more tests, this time on some local Graveyard channels. How to use the phasing adjustment with SdrDx, an AFE822 SDR, and your Mac. Familiarize yourself with SdrDx if you have not used it before. You need two antennas of course, one plugged into each of the AFE822 inputs. Click on the PHA button, turn on Dial Channel Phasing Mode. Click OK to close the window. Click the Run button to get the SDR into Run mode. Tune in whatever MW frequency you want to use. Ideally one with two stations you can hear at the same time. Graveyard channels are great for this. Be sure to put the SDR center frequency offset from that. For example if you want to null 1300 AM, make the center frequency 1305 or something like that. Or the I/Q imbalance will cause problems. Click the PHA button to open the phasing window again. You want to keep it open now. Make sure the Invert checkbox is off, the Both Channels On radio button is on. Set the Phase slider to the middle, both Gains to zero, far left. Adjust the first Gain slider to bring the signal level up to a reasonable level. S9. S9+10, whatever you want. Make a note of it. Now adjust the second Gain slider to bring the signal level up to where it was before with the first RF input. The goal here is to make the signal levels about the same, so you can begin the process of nulling out one of the stations, with some chance of it working. Click Both Channels On now, so you have both RF inputs active. Adjust the Phase control, until you notice a dip in the signal strength. Try to get it centered in the dip as close as possible. Then adjust one of the gain sliders, I usually use the one with the largest value to make things easier, to increase the dip in the signal strength. Then go back to the Phase control, and try to increase the dip. You may now notice the dominant station starting to be nulled, by listening to it. Then, like washing your hair, lather, rinse, repeat. You have to iterate back and forth many many times. Eventually, if your two antennas produce different enough signals for the two stations, you will be able to null it out. There are cases where you cannot null out one station, because the antennas produce the same signal for both of them. So nulling out one also nulls out the other. But this is rare. You can click in the invert checkbox, and reception should switch to the other station. Listen to some of my recordings to hear this in action. You are changing the phase by 180 degrees when you do this. Most impressive, Chris! Wow–I think this feature alone could make the AFEDRI AFE822 an invaluable tool for the mediumwave DXer. Those audio samples are amazing! This entry was posted in New Products, News, Radios, Shortwave Radio, Software Defined Radio and tagged AFEDRI AFE822, Black Cat Systems, Chris Smolinski, SDR, sdrDX, Software Defined Radio on November 27, 2016 by Thomas. I’ve released a new beta of mySdrPlayback, which is a Mac app that lets you easily go through SDR recording files. It works with recording files produced by SdrDx and SpectraVue, as well as Perseus. This version adds a DGPS decoder that decodes from every DGPS channel in parallel, looking for messages. Makes it super easy to DX DGPS stations, just record overnight, then run the recordings through the app in the morning, and you get a list of all of the decoded messages from the various stations. Click here to view the information and download page at Black Cat Systems. This entry was posted in News, Shortwave Radio, Software Defined Radio and tagged Black Cat Systems, Chris Smolinski, Mac OSX, mySdrPlayback, SDR, Software Defined Radio on August 27, 2016 by Thomas. Here’s my Mac Book Pro (2010 model) playing Mary Had A Little Lamb over the radio, by modulating the RFI (Radio Frequency Interference) produced by it and other computers. As picked up on a Sony 7600G receiver. I found the best reception was on the long wave band, although I could continue to hear it well above the AM (medium wave) band, past 1700 kHz. The signal was pretty much everywhere, no matter where I tuned, in 1 kHz steps. Picking up radio emissions from computers is one method that can be used to spy on them. That is fascinating, Chris. While I was well aware that computers and mobile devices (of all stripes) produce RFI, I had no idea that it could be used for spying. I love how you’ve manipulated this interference to play a tune! What a creative hack! 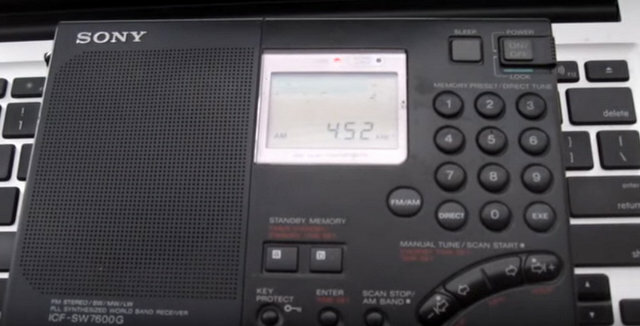 This entry was posted in Funny, How To, News, QRM, Shortwave Radio and tagged Black Cat Systems, Chris Smolinski, Radio Frequency Interference, RFI, Sony ICF-SW7600G on March 6, 2016 by Thomas.